My theory about the purpose of many ancient monuments argues that they were built primarily as memory spaces. Their design was specifically to enable elders to practice their memorisation, to teach it and to perform the knowledge for the community according to the various levels of initiation of the audience. Elders memorised the knowledge on which survival, physically and culturally, depended: entire field guides to all the animals and plants, navigational charts, genealogies, laws, resource rights, trade agreements, land management, astronomy, geology … all in memory. In Knowledge and Power in Prehistoric Societies, I presented ten indicators that a monument was built as a memory space, it was a mnemonic monument. They are listed in decreasing order of importance. In the small scale oral cultures I am talking about, the elders maintained their power through controlling knowledge. In all other ways, the societies appear to be egalitarian. Obviously my starting point was Australian Aboriginal cultures, but Native American, many African and Polynesian cultures also fit the scenario. The imperative to perform the knowledge repeatedly should leave an archaeological record of both public and restricted performance spaces. Platforms, mounds, enclosed spaces, plazas and even flat-bottomed ditches, can act as suitable performance spaces. Restricted spaces ensure those initiated higher into the knowledge can repeat it in secrecy which effectively avoids the so-called Chinese whispers effect. When dealing with knowledge from generations ago, such as surviving severe resource stresses, accurate retention is essential. All historical and contemporary oral cultures value education and formally educate the young. They don’t learn everything casually while out on a daily gather and hunt or round the campfire at night. There is no society which works that way and so there is no reason to believe that oral cultures in prehistoric times were any different. Mobile cultures use significant landscape places in order to keep a record of each aspect of the knowledge. They encode it in the landscape. If a society is to settle they must replicate these set of locations in the local area. That is the very basis of the monuments. But there’s a lot more to it than that! If a monument is a memory space, then there must be a prescribed order to the memory locations so that information is not lost through lack of reference. The ancient Greeks described their locations from their preliterate times: there should be a defined sequence in a location away from distracting passers-by which is well lit, with loci not too much like one another, of moderate size, with a moderate distance between them. My research shows that all oral cultures did this – and we have ample evidence from Australia of a continuous knowledge culture for tens of thousands of years. Circles or lines of stones or posts, a sequence in the ditches or mounds enclosing open space, or large, non-domestic ‘buildings’ would serve as memory theatres beautifully. 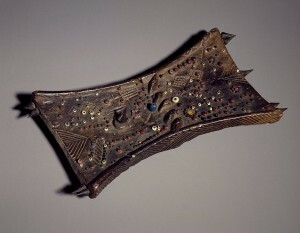 An African memory board of the Luba people, the lukasa. This one is in the Brooklyn Museum. Documented oral cultures use a huge variety of memory aids: inscribed stones, notched or decorated wooden sticks or boards, inscribed bark, decorated hides, dance costumes, masks, props, knotted chords, curated human and animal bones, bundles of non-utilitarian or symbolic objects and representations of mythological ancestors on a wide variety of media. Enigmatic objects found at ceremonial sites which match these patterns add to the argument that the monument served as a memory space. Knowledge is traded in every society I have examined, literate and non-literate. If resources and labour are coming into the site but nothing being manufactured or grown there, then it is logical to assume that it is a place when knowledge is being traded in the form of songs, dances and mythological stories and encoded using a variety of memory devices. Whoever maintains the calendar holds a very powerful role in oral cultures. Detailed astronomical observances were common among complex hunter-gatherers, primarily to maintain calendars and schedule ceremonies. The heavens were also used as memory aids, with characters and stories attributed to stars and planets as it is the case with every society, literate or non-literate. Astronomical alignments add to the argument that a monument is a memory space. Landscape references are critical as memory markers in the oral tradition of both mobile and sedentary cultures. Not surprisingly, most of the enigmatic monuments around the world make some reference to the much wider landscape. Songs are far easier to remember than prose; dramatic performances are more memorable than static recitations. Monuments which are designed to aid memory would have structures which enhance singing, chanting and the music for the dances. And it is those songs which encode all the essential practical information. We know from historic oral cultures that rock art is often used to aid memory of the stories, songs, chants and other aspects of the knowledge system. Abstract art is far more useful as multiple layers of information can be encoded and secrecy maintained. 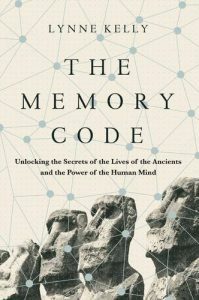 If an archaeological site demonstrated most, if not all, of the ten indicators given above, then it is logical to conclude that the control of knowledge was a fundamental aspect of the culture which constructed the monument. The elders constucted themselves a memory space. And the most elite of them may well have been buried there. 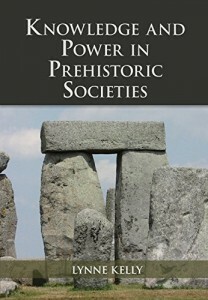 This entry was posted in Cambridge University Press, Knowledge and Power in Prehistoric Societies, lukasa, memory devices, Memory Spaces, method of loci, mnemonics, primary orality, stone circles, Stonehenge, Ten Indicators, The Memory Code, Uncategorized and tagged archaeology, art of memory, Cambridge University Press, Knowledge and Power in Prehistoric Societies, Memory Spaces, primary orality, Stonehenge, Ten Indicators. Bookmark the permalink. 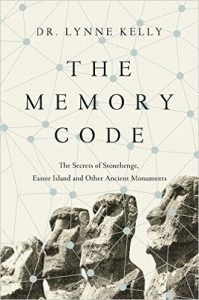 I am half way through your book The Memory Code, and may have missed the information but do you have any theories as to why “art” changed from being used for memory and knowledge spaces to become an elitist practice that served more of an aesthetic purpose than previous applications? I am currently a PhD student at La Trobe University exploring the use of art in mental health, especially the potential for art to be used as a medium for reducing the hierarchical basis of service provision. I have looked a lot at Dissanayake because i think her ideas are important for explaining the potential in mental health. I am thinking that your ideas are also applicable, although i haven’t quite thought it through fully as yet! Regards Nadia. Thank you so much for your comment and really interesting ideas. I have written a bit about the change in art across the orality / literacy divide but it isn’t in The Memory Code. It will be mentioned in the academic essay I am writing for Rounded Globe due for publication in October. It is a topic that interests me greatly and one I intend to follow in my future research, although I suspect I may never get to doing it into the detail I want. There is a bit about this aspect in the references on Classical times by Mary Carruthers and Frances Yates in the Bibliography. I also started looking at this aspect in my last visit to the Metropolitan Museum in New York. 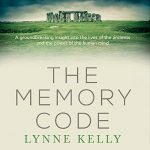 I will be returning to New York and London for the publications of The Memory Code by Pegasus Books and Atlantic Books respectively. I will also be working with researchers there looking at this exact aspect. I am really interested in your approach to this topic. I am an Honorary at LaTrobe, theoretically based at Bundoora, but living in Castlemaine, so I tend to be at Bendigo more often. I am not familiar with Dissanayake’s work – there are so many researchers I should know more about, but I cross so many disciplines, I will never get there. At least I’ll never be bored. All the best with your research. I’d like to hear more one day. If you wish, you can email me at the university: l.kelly @ latrobe.edu.au – I’d like to follow your research. I’m listening to your fascinating conversation with Richard Fidler – a few days after the fact – where you are talking about ceremonies happening in the ditches around the edges of Stonehenge and Avebury. And then you talk about the burials on the site of Stonehenge. I couldn’t help making a link between that use of Stonehenge and the use of side chapels in cathedrals, and the stations of the cross. I wonder if these are an evolution from the ancient ceremonial root. People walk the stations of the cross in the church telling stories. People use the side chapels for ceremonies that are usually specific to the saint to which the chapel is dedicated, and stories are told there. Then the burials – often the important people to the church – the abbot, maybe a local poet, hero or other luminary would be buried there. Funnily enough – up to 250 or so over 1500 years in many cases. I studied Information Science at university so I have a pretty good understanding of how information flows and tokens that people like to use to represent information. Yor work is absolutely fascinating. It also makes me want to go and pull out my ancient Santa Peublo blackware fetish dish, hold it in my hands and imagine. Thank you for such a fascinating and astute response. I have IT qualifications, and for me this really is an information systems theory but I don’t usually express it that way. In IT language, the monuments acted as database structures with the data stored (literally) in memory. Unfortunately, we can never reach the data, only see the structure. Your link to the memory structure of the cathedrals, especially in the Middle Ages and Renaissance is absolutely right. A number of authors, Frances Yates and Mary Carruthers in particular, have researched this extensively. I am writing a bit about that for an academic essay at the moment and want to read into it a great deal more. You have an ancient Santa Pueblo blackware fetish dish?!? I am so jealous. I didn’t buy anything when I was there, not having any idea of the impact the Pueblo culture would have on my thinking – nor the emotional impact. Treasure it! To hold it and imagine – what a gorgeous sentiment. Good to hear from you! At this stage, my theory sees the monuments serving to act as memory prompts only. I expect the ideas will be refined by others and may show that the monuments could provide information. The information itself is retained in oral tradition – specifically the songs, dances and stories, including mythology, in which the information is encoded. The monuments work very much as a complex form of the method known from the ancient Greeks, the method of loci. The complexity is added because indigenous cultures use a variety of memory devices and the domains of knowledge are integrated. One topic, say bird identification, may be served by the set of memory locations but also by various mythological characters represented in art and in the abstract signs on handheld devices. I argue that the Stonehenge chalk plaques and the Scottish carved stone balls worked as portable memory devices, much like the Australian tjuringa and African lukasa, among many others. But in all cases, the actual information is held in memory and lost when the last fully initiated elder dies. That is why it is imperative that we learn from the few elders we have left around the world. We know, in Australia, of the vast store of information they retained. There is evidence of some knowledge dating back thousands of years and accurately retained over that vast time span. How extraordinary is that? My research is on the actual mechanism of the memory technologies. In the cases recorded, the very long term knowledge is mostly changes in landforms or astronomical events. That makes sense, because these items would be critical to the structure of the knowledge system and hence retold more often than the details associated with them. I hope that answers your question. I so wish the monuments provided information which we could eventually decode. I’d love to be proven wrong on that! Hello Lynne, I’ve just come across this information and I think I can see where you are going with this. As an archaeo-astronomer I have surveyed and photographed the sun and moon rising or setting in line burial monuments. With the finding of cremated bone in the Aubrey holes at Stonehenge, I came to the conclusion that it also was a solar/lunar aligned burial monument. I also have an interest in Gaelic and Norse folklore, and there is a reference of someone visiting a well know monument and circling it at the time of the full moon. This monument was destroyed about 200 years ago, but shortly after its location was excavated, I carried out a survey and found that it was aligned to the setting moon. this therefore suggests that the story of the man circling the monument at the time of the full moon was over 4000 years old. There are other traditions which were recorded 300 years ago that link other nearby monuments to the sun and moon. I discuss this in a paper on the orientation of passage cairns which is due to be published next month. Thank you so much for your interest and fascinating comment, Scott. Astronomy is such a critical knowledge domain in all indigenous societies that I have no doubt that archaeoastronomy will become an even more important science as time rolls on. I have no doubt that part of the role of the monuments is as an astronomical observatory to ensure that substance and ceremonial cycles are retained, and to act as a calendar. If everyone appeared, laden with food, at Stonehenge at midwinter solstice – as the archaeology clearly indicates – how did they know when to leave their respective towns all over the country and head for the party? Someone had to be maintaining a calendar in local areas as well as at major sites. I don’t believe the monuments were purely for astronomy. I believe that, like the indigenous cultures I have studied, astronomy was enmeshed in the integrated system which also encoded all the other knowledge domains: plants, animals, geology, navigation, laws, genealogies, land management … Astronomy is also used as a mnemonic device granting characters to star patterns and other astronomical behaviours, which are used to tell stories which encode other genres of information. I wonder if this could also be detected in the archaeology? That is more your field than mine, much as I wish I had the expertise! I also argue in the books that many monuments which are labelled as tombs were more likely to be primarily restricted meeting places in which the bones of revered elders were also placed. All oral cultures have public and restricted performance spaces. Knowledge is restricted to maintain power to those who are initiated, but also to avoid the so-called Chinese whispers effect. I wonder how much your research will support this idea. Why align a tomb? But aligning a memory space would be hugely valuable. Hence I much prefer the term you use, ‘passage cairns’ to ‘passage tombs’. At Stonehenge, 500 years into its use, the bluestones were moved to the centre and the sarsens brought in from the north. It became a heavily restricted site. The pattern from mobile smaller cultures to sedentary farming cultures is very much one of greater restrictedness, such as in the Native American ‘medicine’ societies and African secret societies within cultures. When Stonehenge became restricted, larger public spaces were constructed at Durrington Walls. It also had its restricted areas such as the North and South circles and Woodhenge. I think the dichotomy is public / restricted not living /dead, although there is much resonance between the two. Please let me know when and where your paper is published. I have access to most journals through my university. I’m looking forward to reading the hypothesis in more detail Lynne. It is possible that a secondary set of recent discoveries may concretely support what you are saying. Difficult to know without having a fuller understanding of the hypothesis so may be useful to have a more detailed chat after publication. How intriguing. Any chance of a clue as to what those recent discoveries are? I don’t know if I can wait so long! Thank you, Jon. I do hope you find my approach interesting. We’ve chatted about this before Lynne, but I never asked you if your hypothesis includes or excludes the idea that structures such as Stonehenge are designed to both provide information as well as keeping the memory of some types of information alive?